A good meal at the bar, and a cheeky drink on the side—it’s a solid dinner deal that Sydney-siders love. Our city knows how to “do pubs” pretty damn well, and they’re sprinkled all over our fair city. Whether you’re after a classic pie ‘n’ pint, or ceviche and cocktails, we know a pub for you. Here’s our pick of the best pubs in Sydney. The Unicorn Hotel | Paddington: The chicken schnitzel is monstrous—it’s as big as my head and comes with a side of luscious mash and gravy. FYI, this place also hosts the odd live gig, too. The Friend in Hand Hotel | Glebe: Museum or pub? You decide. Come for the crab racing, stay for the beer. The Riverview Hotel | Balmain: Our picks are the lamb shank pie, and the Sunday beef roast with Yorkshire pud. Pair with their decent wine list, and you’re sorted. The Royal Paddo | Paddington: We recommend you make a beeline for the rooftop bar for peak views of the city and harbour—it’s the perfect place to knock back some bevvies, or one of their signature spritz cocktails. Also, the one-kilo T-bone steak. The Lady Hampshire | Camperdown: Good local breweries on tap, and suburb-named burgers are on the menu at this one. Plus, on Mondays and Tuesdays, there’s a cheap as chips $12 menu and we’re all over it (obvs). The Carrington | Surry Hills: Some pubs are “dog-friendly”, while others lay out the fricking red carpet for your pooch. The Carrington offers $6 beef tartare or steak and veggies for your doggo, which makes that can of Pedigree look like...dog food, really. Oh yeah, they do really good human food and bevvies here too. The Courthouse Hotel | Newtown: The Courty is nothing fancy, and that’s why we love it. With narrow corridors, weird carpet, and a crowded beer garden—this one is pumping every weekend. Banksia Hotel | Banksia: Colin Fassnidge gave the humble bistro a menu-makeover so we suggest you order the epic braised lamb shoulder to share—it’s served with colcannon (Irish mash) and grilled leeks, and is a bloody knockout. 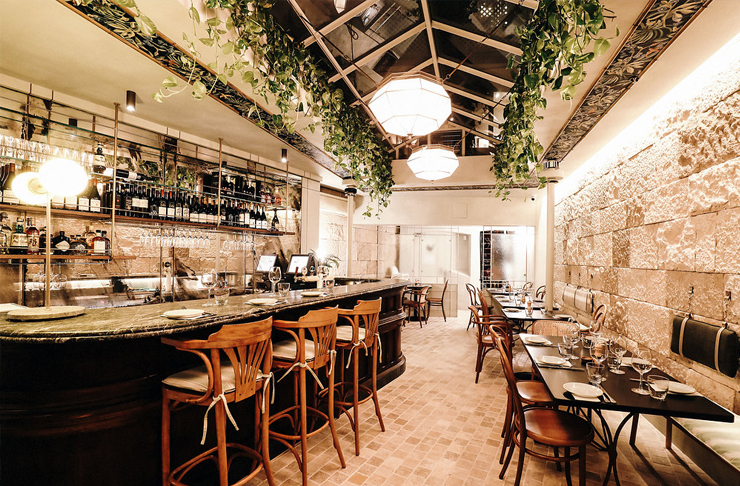 The Dolphin | Surry Hills: With a wine room, all-white dining room, public bar and bottle shop, The Dolphin is like a mini-culinary-choose-your-own-adventure universe. At the public bar, choose between very good pizzas, cheeseburgers, and minute steak with fries. Duke of Clarence | Sydney CBD: The Duke is unapologetically British with cosy London feels and a fireplace that’ll keep you warm all winter. Our fave part? Their Sunday roast (just make sure you book). The Queens Hotel | Enmore: Another Merivale success story, combining upmarket pub vibes with a mod-Chinese menu, the dumplings here might be more exxy than your usual yum cha prices but if you’ve got dollars to spare, you’re in for a good time. The Erko | Erskineville: The on-site smoker churns out delicious beef briskets, ribs, smoked salmon on the daily, plus, the bar here has an impressive rotating roster of beers on tap. The Duck Inn | Chippendale: A classy, dare we say it, gastro pub that’s ideal for long lunches, the Sunday roast specials here are highly recommended AND they have “doggy date nights”. BYO dog, get cheap drinks. Botany View Hotel | St Peters: Nab a decent schnitzel or burger from the downstairs bistro, then grab a sweet spot on the upstairs verandah. Sydney Park Hotel | St Peters: This under-the-radar heritage listed hotel has had a spruce, from its new accommodation digs to its menu. You’ll find pub classics—parmas, schnitzels, black Angus sirloins—all cooked with care and quality ingredients. Vic On the Park | Marrickville: a local fave, all we need to say about this one is bring your pooch and settle in, because it’ll be a lovely beer-filled arvo in their beer garden. The Henson | Marrickville: This neighbourhood pub says a big fat yes to children and pets—there’s even kids’ play area in the beer garden. The Clock | Surry Hills: Ordering salad at a pub is like ordering the fillet o’ fish at Maccas—it just isn’t done. Exception: The Clock. The beetroot and quinoa salad is surprisingly good, especially if you add on your halloumi or avo, plus the upstairs balcony is excellent for Crown Street people watching. The Glenmore | The Rocks: The rooftop is a no-brainer for million-dollar views of the Harbour Bridge. The Park House | Mona Vale: The Mona Vale Hotel has had a YUGE face lift and it’s emerged as The Park House. With one of the prettiest beer gardens in Sydney (it’s true, we promise), a prime seaside location and a hefty food menu (their words, not ours), this one’s a bloody winner. The London Hotel | Paddington: We love the Union Jack table tops, the schmick courtyard, and the dog-friendly policy. There’s a food or drink special every day of the week, so grab your doggo and go. Woolwich Pier Hotel | Woolwich: Sydney’s prettiest pub, perhaps? Take the ferry to Woolly Pier, and treat yourself to a fancy pub lunch. Weekends are super popular so we suggest you book. The Sheaf | Double Bay: They mix a mean cocktail at The Sheaf and while their signature cocktail list may be light and bright, they do an excellent classic negroni, too. There’s live music six nights a week—you know what to do. The Imperial | Erskineville: The Imperial has had a big makeover recently, and it’s returned to its drag-queen roots in a big way. At Priscilla’s, you can “drag and dine”, i.e. graze on ceviche then soak up a drag queen show. The Bank Hotel | Newtown: Be warned—it’s a labyrinth here. The windows at ground level are good for people watching; the beer garden out back goes off, always; or hunt out the Uncle Hops craft beer space. Meanwhile, upstairs is the popular Waywards bar for excellent live music and comedy. Keg & Brew | Surry Hills: If you like craft beer, you’ll like it here. The beer-on-tap offerings are always changing, and on Thrifty Thursdays, you can score $5 schooners and $12 jugs all day long. Lord Nelson Brewery Hotel | The Rocks: Australia’s oldest (continually licensed) hotel and pub brewery, this place is pouring award-winning ales, brewed onsite. 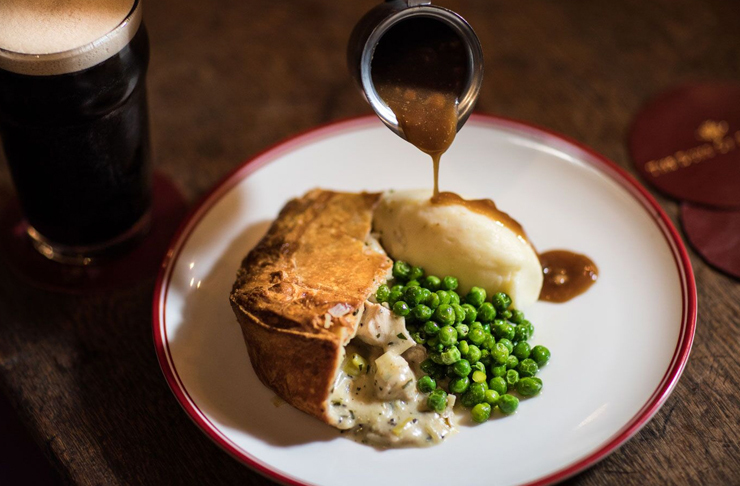 Food-wise, we’re suckers for the classic beef pie served atop a mountain of mash, mushy peas and gravy. The Taphouse, Darlinghurst: Craft beers anyone? They have up to sixteen on offer every day of the week at the Taphouse. Choose your favourite spot at this three-level pub and sip away. Watsons Bay Boutique Hotel | Watsons Bay: Mingle with the beautiful people at this pub-bar-restaurant with a view and if your wallet is looking good, splash on the $220 deluxe seafood platter, we dare you. The Union Hotel | Newtown: Who doesn’t love a good kangaroo steak? The medium-rare kangaroo tenderloin is served with swede and parsnip purée and on Mondays you’ll score $10 burgers and a Nintendo 64 games night. Coopers Hotel | Newtown: It’s one of Newtown’s original pubs with a decent roster of weekly specials. Personally, we heart the two-for-one menu specials on Wednesday nights, eaten on the rooftop beer garden, of course. The Oaks | Neutral Bay: Yep, there’s a massive oak tree in the beer garden—grab a drink from the garden bar and soak up a sunny afternoon. The Lord Dudley | Paddington: Hello fireplace, I’m looking at you. The Lord Dudley is a Paddington institution, attracting locals and visitors alike. Get cosy on the lounge with a beer in hand—they have twenty of them on tap, or settle in at their restaurant, The Garden. 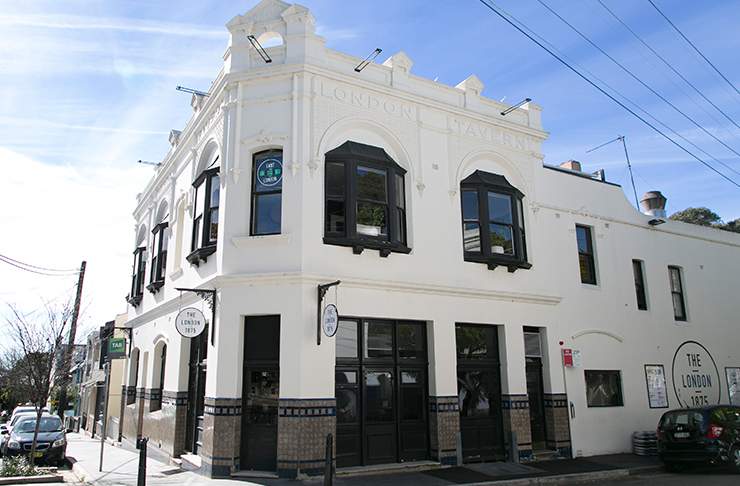 Darlo Bar | Darlinghurst: Or, “The Royal Sovereign Hotel”, if you want to be proper. Downstairs is the humble public bar, up top is the swishier rooftop bar. Pick your vibe, and soak up the good times. East Village | Darlinghurst: Tuesday night trivia with Breko (and his fabulous jackets) is a cult hit here. There are three levels, but we dig the rooftop for the most for ‘grammable views. Kirribilli Hotel | Milsons Point: If you miss the surf ‘n’ turf dining trend of decades past, never fear—for an extra $6, you can tack on prawns to your steak of choice at this Sydney pub. It’s probably not the sole reason it’s Milsons Point’s favourite neighbourhood pub, but hey—it’s gotta help. The Oxford Hotel | Drummoyne: Sure, it’s no longer called PJ Gallagher’s, but post-renovations, there’s still charm to be had at the Oxford. We’re fans of plaid, so we’re glad to see it making a bold appearance on the carpet in the pool room. Public House | Petersham: In a Venn diagram of beer, beer garden and pizza, the Public House is the happy bit in the middle where all three collide. The Macquarie Hotel | Liverpool: A stand-out in Sydney’s west, the bistro has had a spruce courtesy of Colin Fassnidge and head chef Leigh McDivitt (ex-3 Weeds pub in Rozelle). They do classic pub staples of burgers and steaks, and pull out tasty pork and beef ribs from their in-house smoker. The Collaroy | Collaroy: A sweet spot for post-beach hangs, to simply call this spot beachfront doesn’t even do it justice. The Rose Hotel | Chippendale: Teeming with uni student and pool players, The Rose Hotel is a classic good-times hang out. Grab a beer from one of their 24 taps, and settle in on their picnic tables out back. Light Brigade Hotel | Woollahra: The art deco hotel has been kicking around for 120 years, taking very good care of Woollahra locals. We like the semi-circle booths best, but sport-watchers may want to get closer to the 103-inch plasma. Hunters Hill Hotel | Hunters Hill: The HHH’s beer garden puts others to shame. Gone are the squeaky benches and splintered tables—they’ve got cushioned seaters, heaps of foliage, and strategically placed outdoors heaters. Bevvy up and settle in for the arvo. Highfield Caringbah | Caringbah: This one is literally a four-in-one venue. There’s Ugly Pizza which is better than it sounds, Huxley’s Sports Bar that’s known for American classics, the Public House for your classic Aussie pub and a banging rooftop bar, The Botanical. Want to hit up Sydney's best two-for-one pub specials next? Head here.